I ordered this as a surprise for KT-J! I'm emailing her the BCID now to catch it. Thanks Stubee, this is a lovely surprise! I'll have to get onto this shortly! Wow, what an amazing book. I didn't really know what to expect as reading the back cover it sounds quite depressing but this book was brilliant. It was awful, heartbreaking and sad but also compassionate, humorous and uplifting. 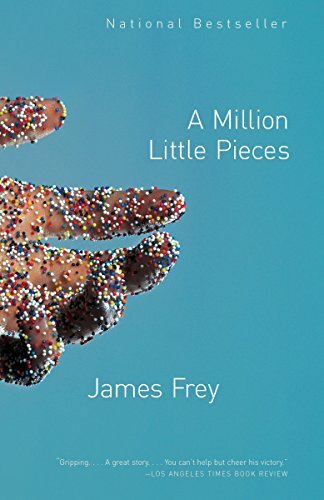 The life that James Frey had lived until he went into rehab, and the journey he took, the difficulties in fighting something that was ultimately killing him was terrible to read and desperately sad but really sheds a light on the feelings and actions of people in this position and the hard work that addicts who are sober have to face on a daily basis. I think the worst part was reading the last two pages about where some of the people in the book are now and what happened to them. I found the book not too easy to read at first just from the way conversations are written without any quotation marks, and the chapters are really long without any natural breaks. But this didn't detract from my enjoyment of the book. I definitely am glad that I've read this and I look forward to reading the sequel, My Friend Leonard. I'm going through my bookshelf and trying to find new owners for any books that have been read and are not going in my Permanent Collection. This is one of them. I've added this to the Ramdom UK Bookbox I started.